A great story may be told thousands of times and still touch us again and again. Such is the timeless power of drama and the truth of storytelling. The Word Made Flesh series captures these familiar Biblical stories with passion and new meaning for today's audience. 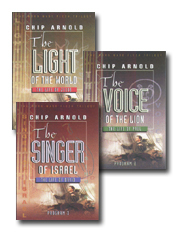 This contemporary film trilogy, written and performed by Chip Arnold, presents the lives of Jesus, Paul and David through three one-man stage presentations. There is no doubt that these stories will stay with you long after the performances have ended. "The Light of the World: Jesus" follows the story from the Jordan River to its end at the Mount of Lives. Meet His disciples, feel His compassion, listen to His teaching, and share in His suffering. "The Voice of the Lion: Paul" presents Paul as a young idealist intent on making a name for himself. Feel his agony of confrontation with Jesus on the road to Damascus, then feel his joy in the realization of Jesus' grace. "The Singer of Israel: David" reveals David in all his strength and weakness, yet shows us God's full compassion for him.